Despite our initial enthusiasm, we didn’t take action for a long time. Deciding to leave your normal lives to travel across the country for six months (or a year) is a major life decision. We had to stew on the idea, to savor it. We had to consider the pros and cons. 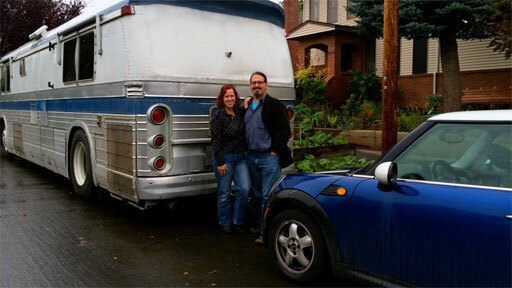 We both chatted with friends and family about their experiences with RVs and trailers. We read websites and watched videos. After a few months of research and contemplation, we were ready to put our dream into action. Kim and I have traveled the world together; now we’ll explore the U.S.
First, we had to decide what sort of rig to purchase. We could buy either a trailer and a truck to tow it, or a self-contained recreational vehicle. Each option had its pros and cons. With a travel trailer and truck, we’d have a greater selection of floorplans. Trailers come in all sorts of layouts, whereas RVs tend to adhere to a few standard designs dictated by their very nature (a house on wheels). But neither of us was keen on towing — especially backing into tight spaces. Plus, we didn’t like the idea of having to constantly hitch and unhitch the trailer. Finally, we wouldn’t have access to our living quarters while we were on the road. A motorhome, on the other hand, would be easy to drive — especially a Class B or Class C RV (see below for explanation of RV classes). One person would have access to the living quarters while the other person drove. On top of that, we could tow my Mini Cooper to use as local transportation whenever we camped. We decided to focus our attention on RVs instead of trailers (although we agreed not to rule out the idea of buying a truck and trailer). But what class of RV? Class A motorhomes tend to look like a bus. Because they tend to be large, they often feel spacious and luxurious inside. Class B motorhomes tend to look like a van. While they usually have everything you need — a bathroom, a kitchen, a bed — there’s not much living space inside. Class B RVs are nimble in the city, but cramped when camping. Class C motorhomes tend to look like a delivery truck (think U-Haul). They’re a sort of compromise between a Class A and a Class B, offering more maneuverability than a Class A and more living space than a Class B. Next, we set a budget. New RVs aren’t cheap. It’s easy to spend $80,000 or $100,000 or $200,000 on a coach — and then, like a car, the new rig will lose 15% of its value in the first year and continue to depreciate rapidly for a decade. We knew from the start that we wanted to buy used rather than new. We wanted to minimize how much we’d lose to depreciation. “I think we should aim to spend less than $10,000,” Kim said. But that target didn’t last long. For $10,000, we could buy a twenty-year-old fixer-upper, and that didn’t appeal to us. For a long time, we toyed with a $20,000 budget, but even then we weren’t comfortable with what we could buy. Ultimately, we doubled that figure. By October, we knew a few things: We wanted to spend six months to a year traveling across the United States and Canada; we suspected a Class C motorhome would be the best fit for us (but we were open to other options); and we had a budget of $40,000 to buy a used vehicle, although we hoped to spend less. A few days before Halloween, I met up with Chris and Cherie, the Technomads. They’ve been living in an RV full-time for almost a decade and just happened to be in Portland when I emailed them to ask for advice. I took them to lunch and picked their brains about what it’s like to live on the road. They gave me a tour of their current home (a converted 1961 GM bus!) and talked about the pros and cons of different modes of travel. Do you have a way to follow your new blog by getting an announcement via email? The subscribe button should be fixed now, please let us know if you still have problems. I will echo this question! How do I sign up to follow this by email? I am looking forward to following your adventures, but I know myself, if it doesn’t show up in my email, I won’t see it! Thanks! Hi Scott, sorry we’ve been in the “working stages” of the website, but the subscribe button should work now.